10 x 1ml B Braun Omnican insulin syringe 30g 1 2 needle. BBraun omnican fixed needle 1ml insulin syringe. 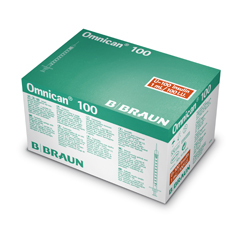 The Omnican® syringe is a high quality fixed needle 1ml insulin syringe with a 30g needle, manufactured by B Braun. The Omnican syringes are supplied in bags of 10 with plunger caps to ensure sterility.